Below is a presentation that I presented at Teachmeet Melbourne (27/03/2014). It reflects some ways I have used QR Codes in my teaching practice. There are so many different ways you can use QR Codes in the classroom. It really is endless and all up to your imagination what you can create with them! What are some other ways you have used this wonderful tool in the classroom? 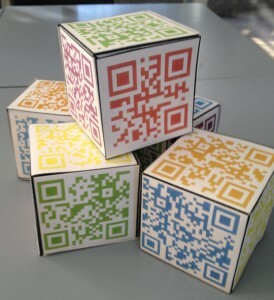 I made the reading cube where the QR code linked to different online texts I wanted my students to read. I’ve used QR codes to link to a survey for parents and students at the beginning of the year. I like your cube concept. Does it grow old over time? I also appreciate your suggestion of linking the QR Code to a audio or video recording. I’ve used aurasma before, but it often takes a long time to upload and is sometimes finicky. QR Codes would simplify that project. Thanks for the ideas and the slideshow. Thank you for this resource. We are starting to use Seesaw in our school and I will be encouraging classes to use this to promote student reflection. I have used them as links to google forms with a pre assessment test at the start of a math unit to try and understand what students already know and what they need to know.